This is my first entry to Rachel's Baking Challenge. The theme for June's challenge was strawberries. My first thought was strawberry pie, but truly pie is not one of my giftings in cooking. And then I thought about rhubarb. I had plenty of it growing in my garden and I love the combination of strawberries with rhubarb. But what to make that is tasty and not so common? I pulled out an old cookbook my mom had given me. It is called Cookery Carosel and was produced by the MEI ladies auxiliary in the 80's. I have the second printin (1988). For those of you going who? What? MEI is a private school in the town in B.C. I grew up in. It stands for Mennonite Educational Institute and no, I didn't go there. But having grown up in a community with lots of Mennonite families, I know just how wonderful their recipes are! I found a recipe for Rhubarb Cake and adapted it to add strawberries. The result was really tasty. 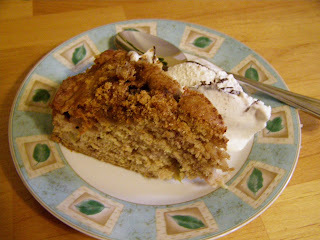 It's a coffee cake that we served up with ice cream. My friends who we shared it with really loved it. Bake at 350* for 35-40 minutes. I used a large springform pan (like you would for cheesecake) to make this as a round cake rather than a rectangle. 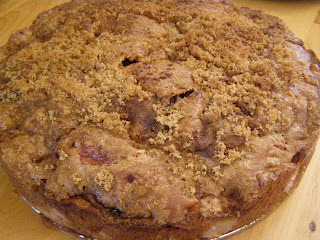 The original cake called for 1 1/2 cups cut up rhubarb and no strawberries. The strawberry rhubarb combination sounds delightful to me and your cake looks absolutely marvelous! What an awesome way to use rhubarb! Looks delicious! I'm going to have to bookmark the recipe so I can try it myself. This looks delicious. I love all those crumbs on top. I only wish I could see all the lovely filling! What a lovely recipe! I haven't cooked with rhubarb in years, I'm looking forward to trying this. Yum! Strawberry and rhubarb are a match made in heaven! This sounds delicious...I can just imagine it warm with a little creme fraiche drizzled over it....drool! I'm such a dork! I don't know how I missed that first picture. I've been thinking of this cake all day, I had to come back for anohter looksy! Oh yummy! I'd love a piece of this with a big scoop of whipped cream! I've never used rhubarb all that much before, but this looks like a delicious combination! Pay it Forward Giveaway Winners!